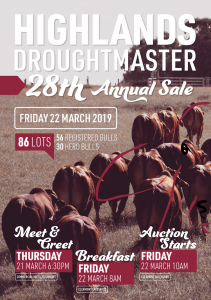 The 2019 Highlands Droughtmaster Sale catalogue will be uploaded by 1 February 2019. The Highlands Droughtmaster Sale catalogue is now available to view and download below. Please contact the selling agents for further information.